Sunshine Coast Homes for Sale in BC Canada - Find YOUR Dream Home! Below are all the homes for sale on the Sunshine Coast, BC Canada. 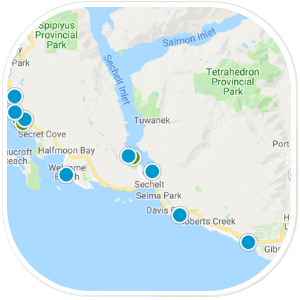 The Sunshine Coast is a beautiful stretch along the southwest coast of British Columbia and includes Langdale, Gambier Island, Gibsons, Halfmoon Bay Keats Island, Nelson Island, Pender Harbour, Egmont, Roberts Creek and Sechelt. Known for it's small town feel, sweeping ocean and island views and easy access to hiking, boating, kayaking, shops and restaurants, it's a nature lover's paradise. It's just a scenic 40 minute ferry ride from West Vancouver, BC.